I'm really enjoying revisiting polishes from the past. A brand that has really fallen by the wayside for me lately is Sally Hansen. I don't feel they really standout as a drugstore polish brand anymore. They have newer lines like "Insta-Ombre" and "Pearl Crush", but I personally find them to be poorly conceived a made. Sally Hansen hasn't had a successful fun line of polish in awhile. It's back to the vault in this case. I rediscovered this gem from their HD Hi-Defintion line a few years back. 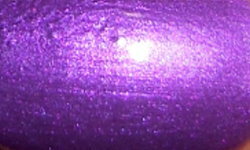 Cyber is a grape lit from within shimmer. Color: This is a beautiful glowing purple. This is a teensy bit more red-toned than my camera is picking up. I don't see many intense shimmers like this anymore except from Zoya. I love the saturation of this color this color too. Formula: I remember this formula being thin when I purchased it 2009. This is downright watery now. I don't recall if it was watery back then or it is now. Normally, polish thickens with age. This is very sheer and watery. I needed 4 coats to build opacity, but this is probably the thinnest polish formula I've used in a long time. Price: I'm happy to report you can still purchase this online. I found a few results on eBay for under $8. Overall: Despite the ridiculously watery formula I really love this color. I don't have many shimmers like this especially in such a bright color. Oooh, I'd forgotten how great a purple that one is! I have it and just found it to look at it in person - yup, still stunningly gorgeous. Thanks for reminding me! I bought this and never wore it, shame on me, SHAME! I do remember it being watery in the bottle, and probably when I swatched it. It's so pretty though!!! I never thought of that. Thanks! I hope Sally Hansen can get their act together.